Info "Roll Samus into the target and knock it down. 2004: Metroid Prime 2: Echoes / Nintendo GameCube"
Metroid Prime 2 is one of 9-Volt and 18-Volt's Microgames in WarioWare: Smooth Moves. The game is based on Metroid Prime 2: Echoes. 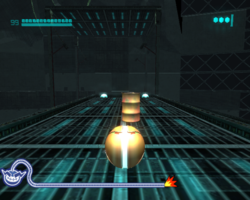 The player controls Samus in her Morph Ball form. The player must tilt the Wii Remote to make Samus knock down the barrel. If Samus rolls too far inward the player can tilt backwards too. 1st level difficulty: The barrel is directly in front. 2nd level difficulty: The barrel is somewhere in front. 3rd level difficulty: The barrel is behind a bumper obstacle. This page was last edited on February 20, 2018, at 17:00.